What's the point of going to see live entertainment if there's no live laugh-worthy screw ups? LumiAir on the Gold Coast was a cirque extraordinaire which ran for 13 nights from Boxing Day 2012 until the 6th of January 2013. 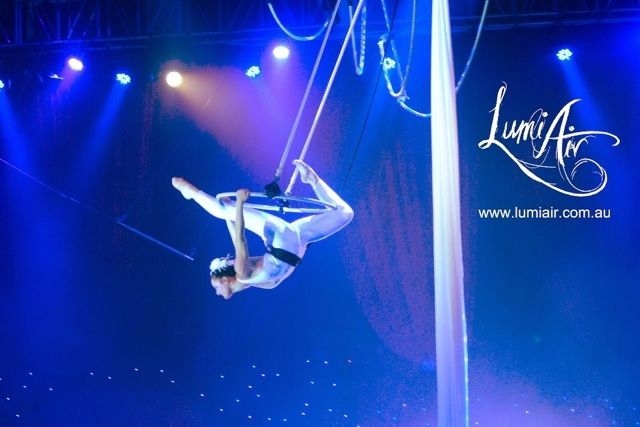 The fifteen hundred seater white circus tent was set up in all its glory on the Southport Broadwater Parklands, and at night came alive with the magic and mystique that is the circus. 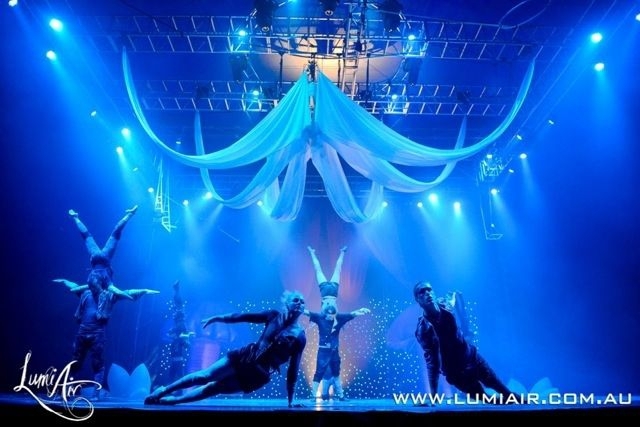 Although, it wasn’t just any circus, it was a production, with LumiAir featuring 45 of Australia’s best cirque performers, as well as international acts. LumiAir in English is ‘light air’ and, as the storyline of the two hour performance shows, is about a girl who struggles through the land of darkness, not accepted as one of them until she stumbles into a world of light and colour. She is instinctually attracted to this land of dance and play, and as the audience, you look upon and experience with her the new exciting colours that come with it. It is a visually stunning performance with each act sewn seamlessly to the next with breath-taking dances and heart-stopping leaps and falls. A show that many said was similar to that of Alice in Wonderland. Opening night was stressful as the cast had barely had a dress rehearsal and one of the main acts had had to be cut for safety reasons. But like always, the show must go on, and go on without the audience suspecting a thing. Each night onwards became a greater success, with more and more people showing up, and each transition throughout the show becoming more efficient. However, it wasn’t until the 4th last show, when everyone had fallen into a pattern and was so used to the happenings of the production, that we had our first real drama. It was during the act Lords of Lightning that the cast backstage all got a little shaken. The act itself is one that the cast had watched during rehearsals with a mixed level of curiosity and fear. Electricity is sent through a coil, which is then conducted through a man wearing a tailor-made suit of rubber and chain mail. It’s an especially aesthetic piece with snappy dance choreography and marching umbrellas, all while a man is standing upon a giant coil conducting crackling lightning bolts. However, on this night, halfway through there was an incredible roar, so loud that everyone backstage was almost certain something had gone terribly wrong. But backstage no one could see anything, and so the assumptions in everyone’s heads jumped, as the crackling static roar took over the tent. Half of the people backstage ran outside, some in between dress changes, and the other half poked their heads around the curtains to see what was happening, while the stage crew were running around pulling out plugs. Of course, everyone outside the tent had assumed that something had gone wrong with the electricity, when really what had happened was that the electricity had interfered with the sound system. When the loud static finally cut off, the audience cheered and applauded, and what was one night of drama for the cast and crew was one night of high excitement for the audience. And let’s be honest, what’s the point of going to see live entertainment if there’s no live laugh-worthy screw ups? We leave being perfect to the movies.